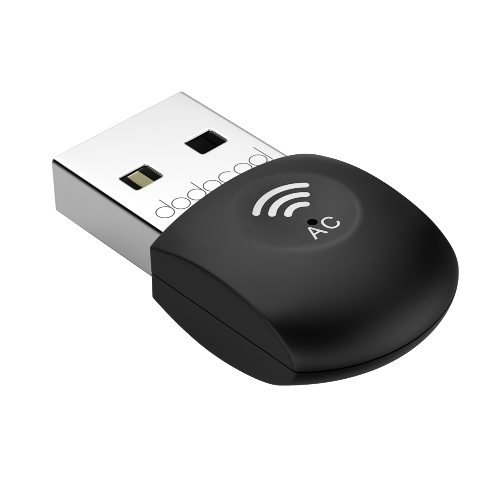 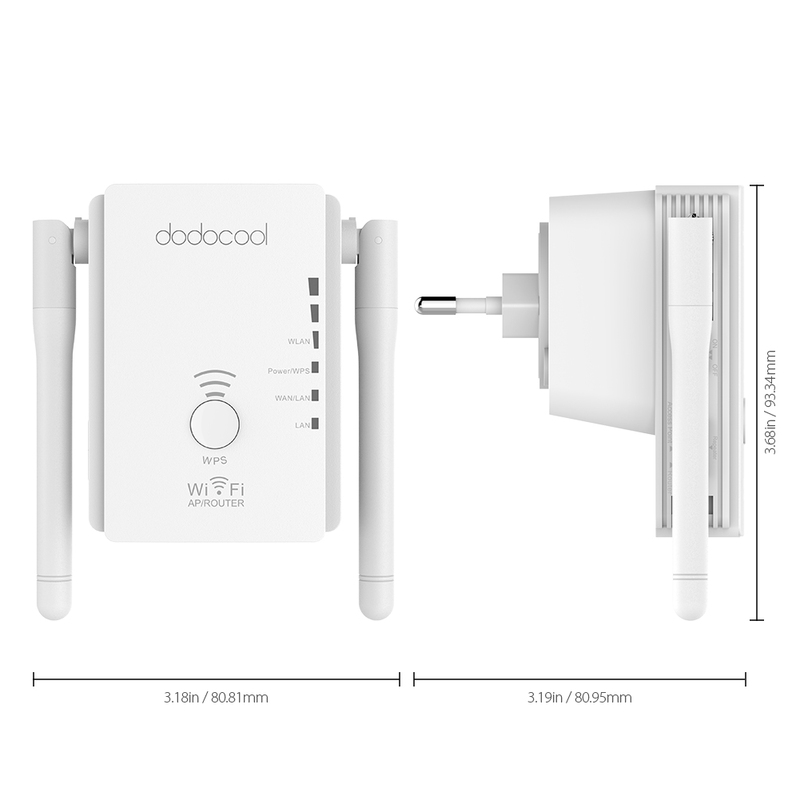 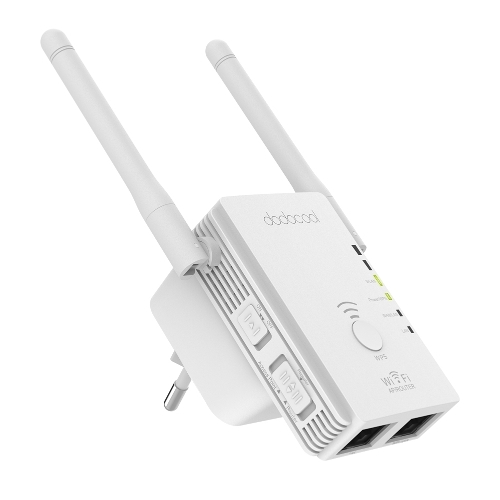 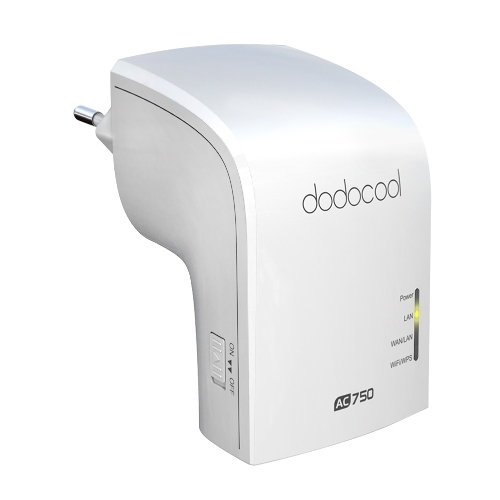 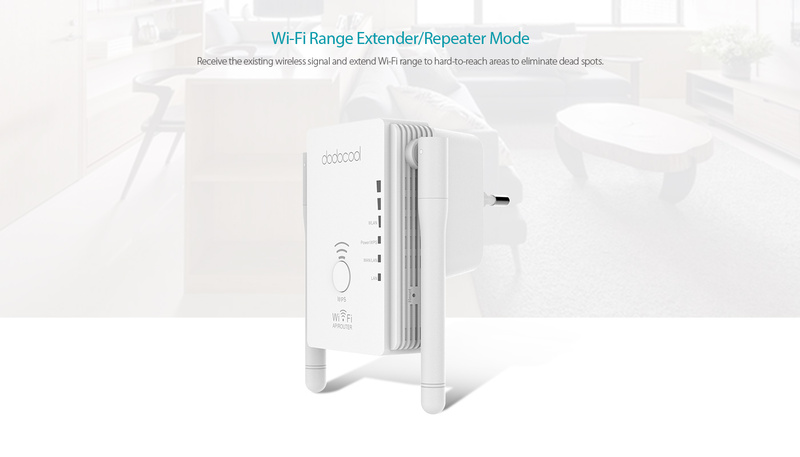 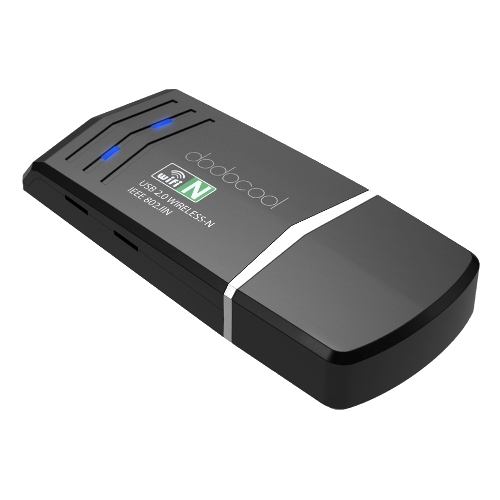 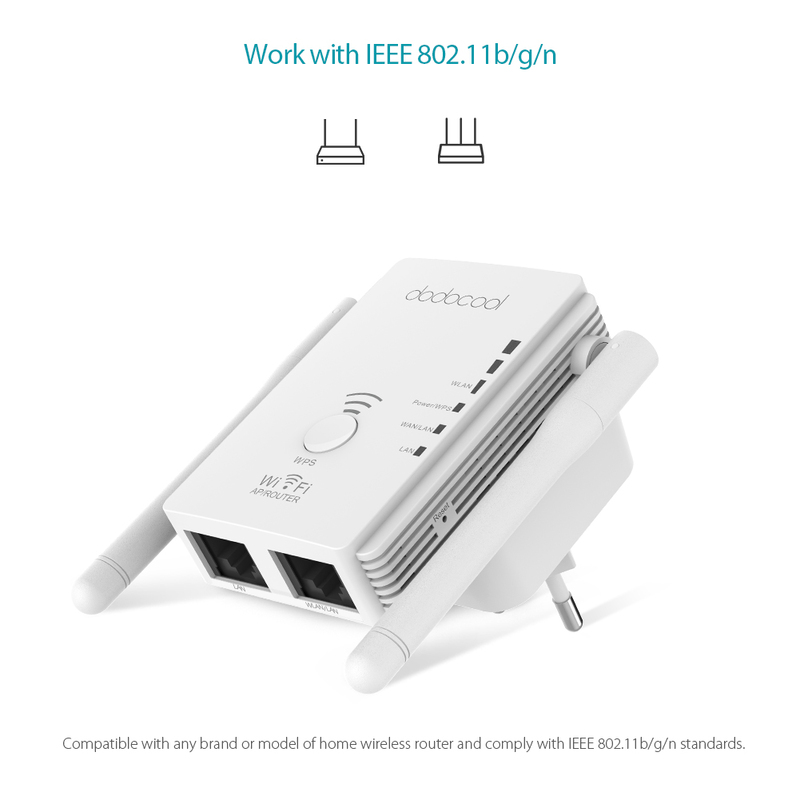 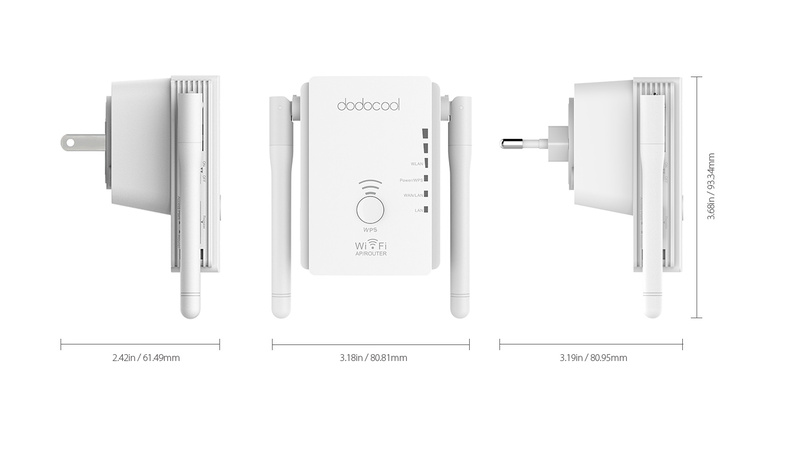 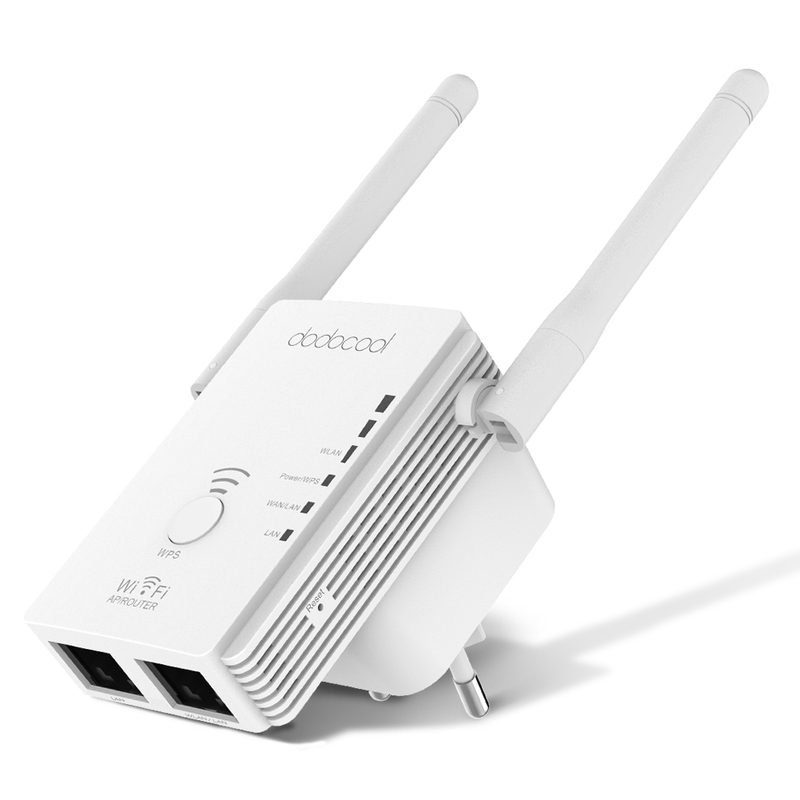 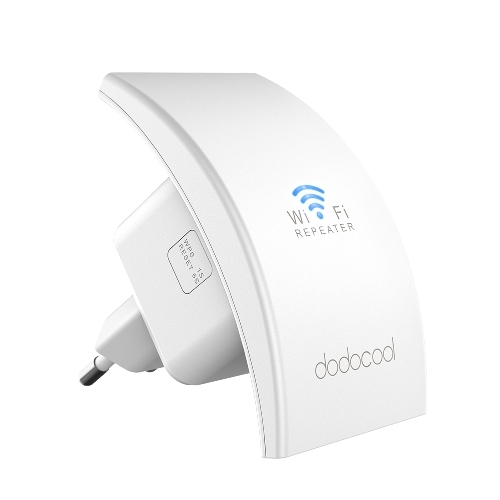 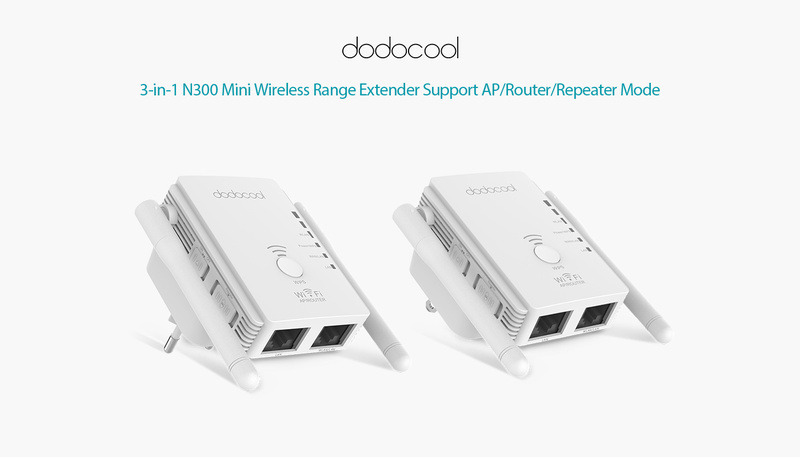 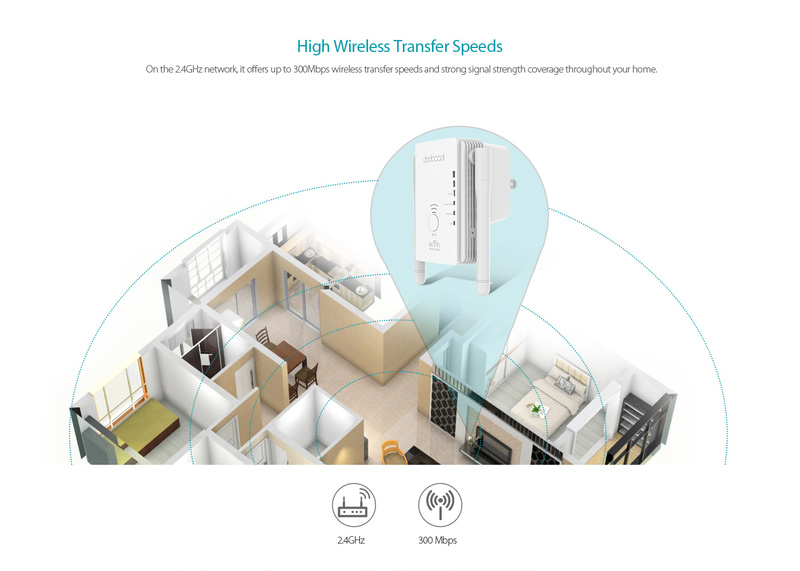 dodocool Wireless N AP/Router/Repeater delivers wireless speeds of up to 300Mbps and creates a highly efficient private wireless network throughout the home. 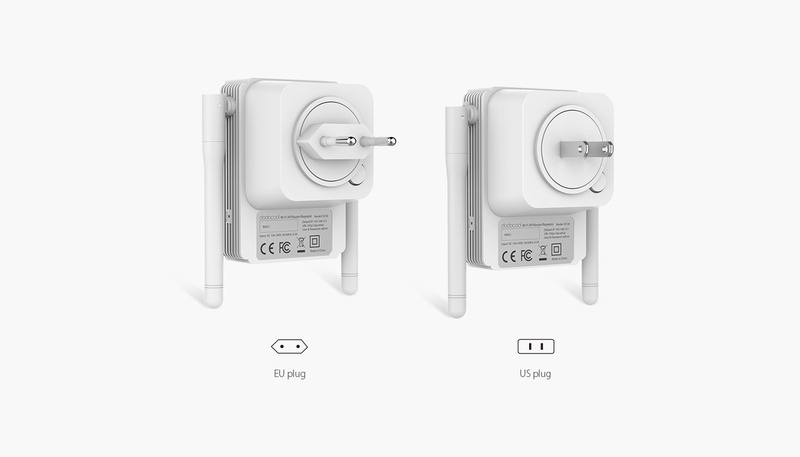 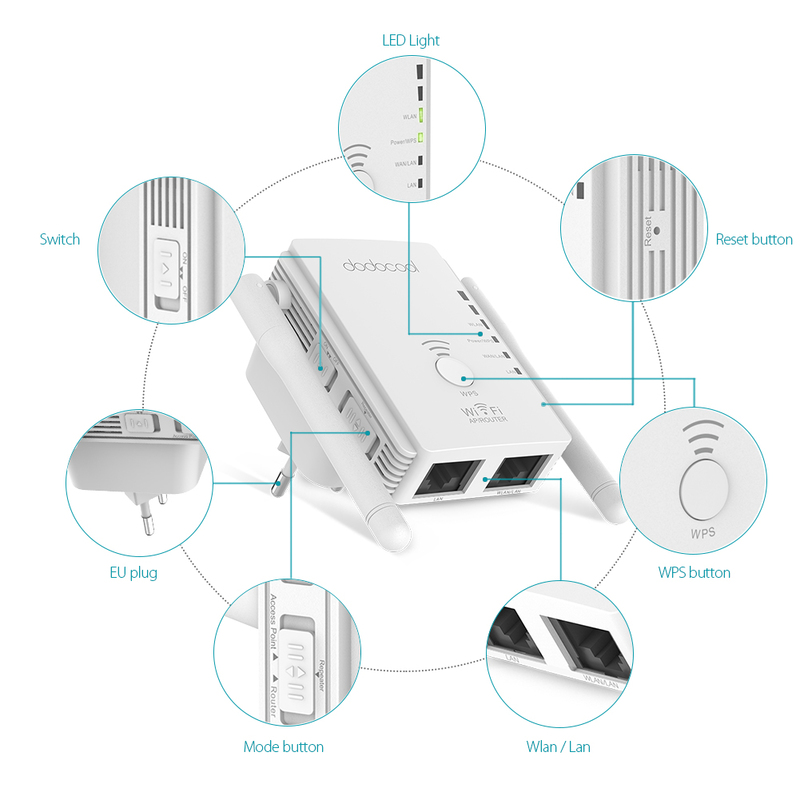 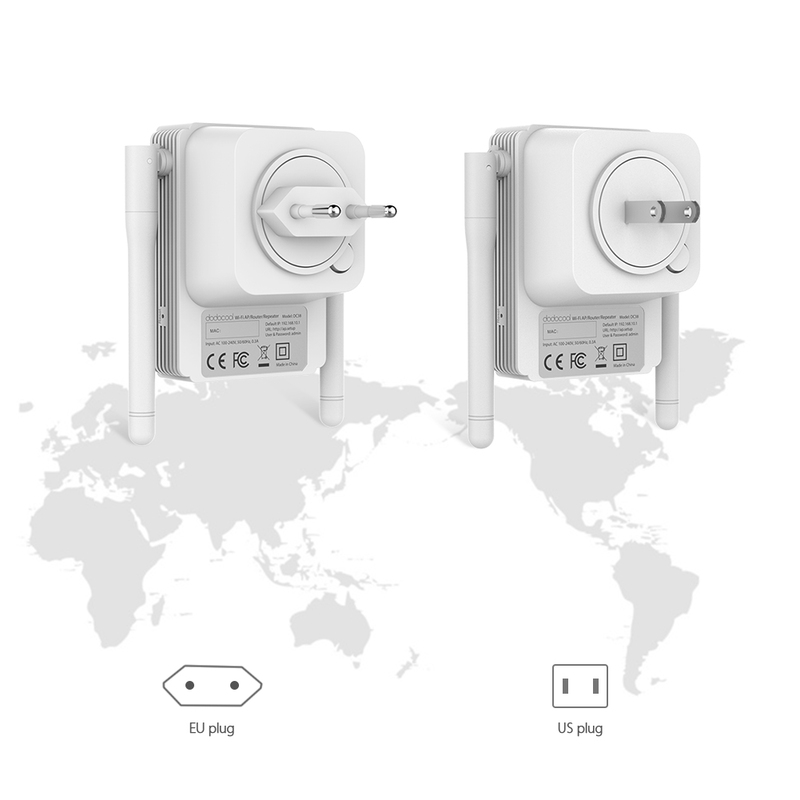 Plug it directly into an electrical outlet and choose among the wireless router mode, signal repeater/range extender mode or access point (AP) mode using the mode switch. 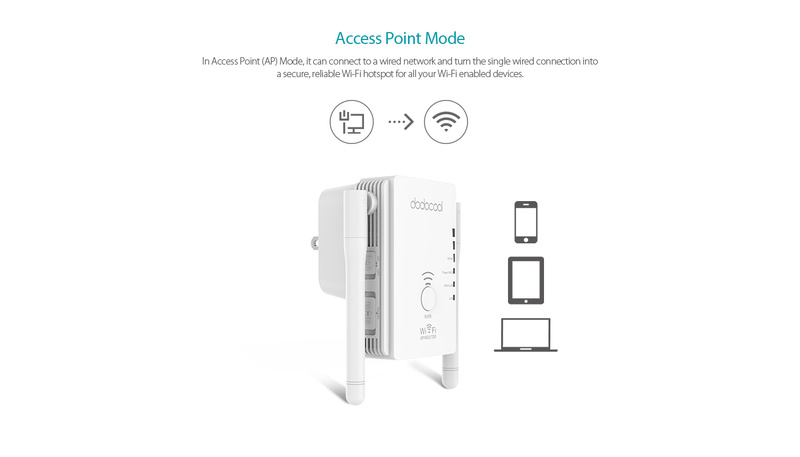 It is an ideal solution to extend Wi-Fi coverage, improve wireless signal strength and keep mobile devices, media players and computers connected to Wi-Fi in every corner of your home. 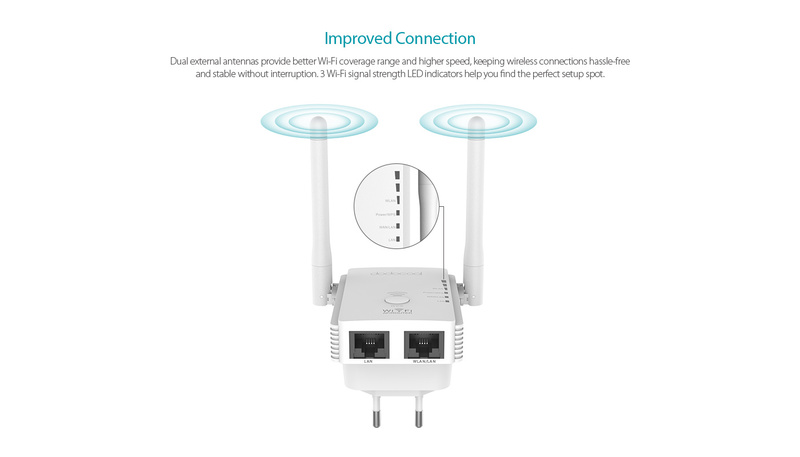 Connect to the Internet via the (included) RJ-45 cable and create a highly efficient private wireless network and provide better performance for surfing and downloading. 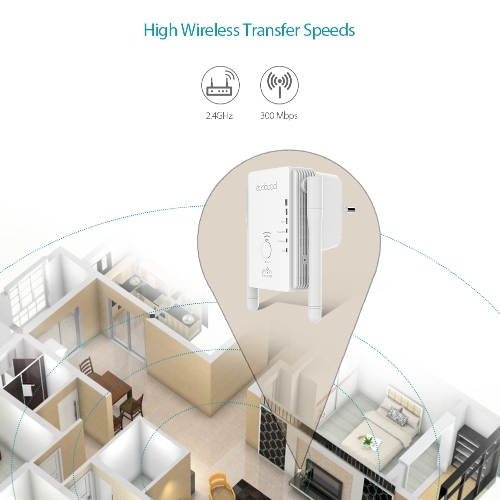 On the 2.4GHz network, it offers up to 300Mbps wireless transfer speeds and strong signal strength coverage throughout your home. 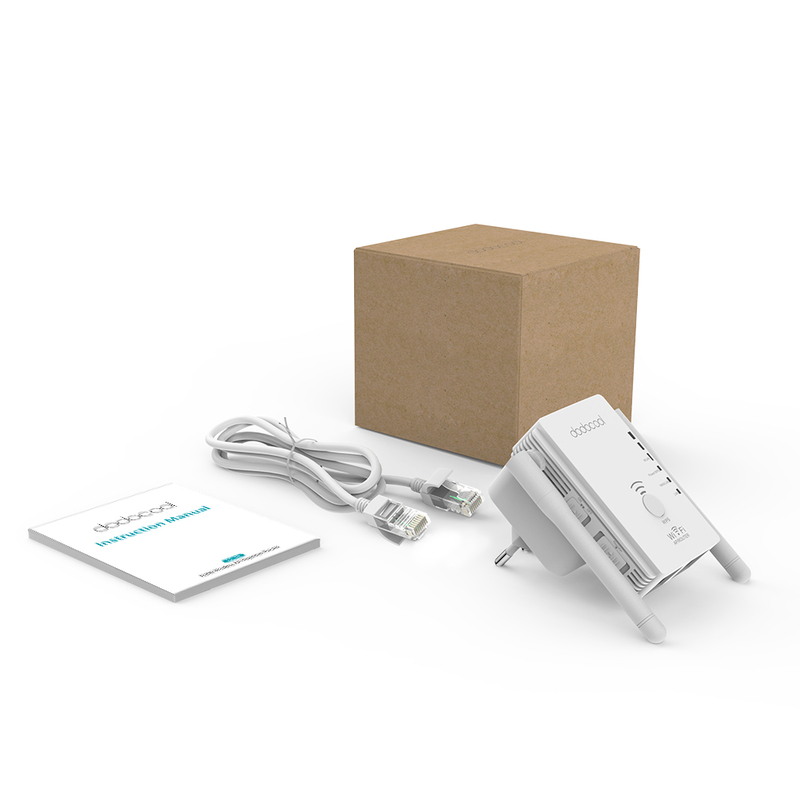 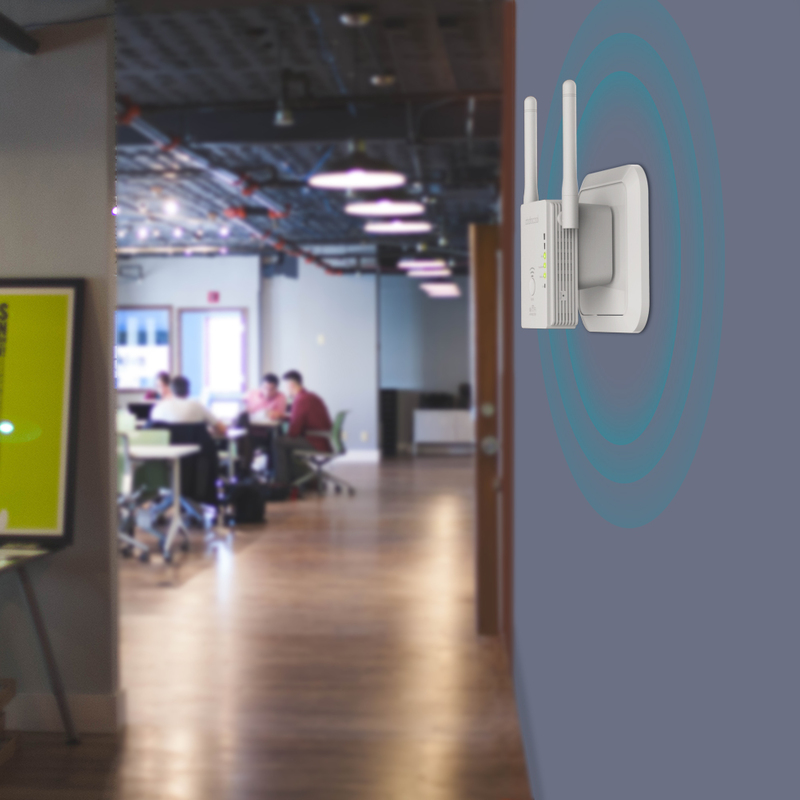 Receive the existing wireless signal and extend Wi-Fi range to hard-to-reach areas to eliminate dead spots. 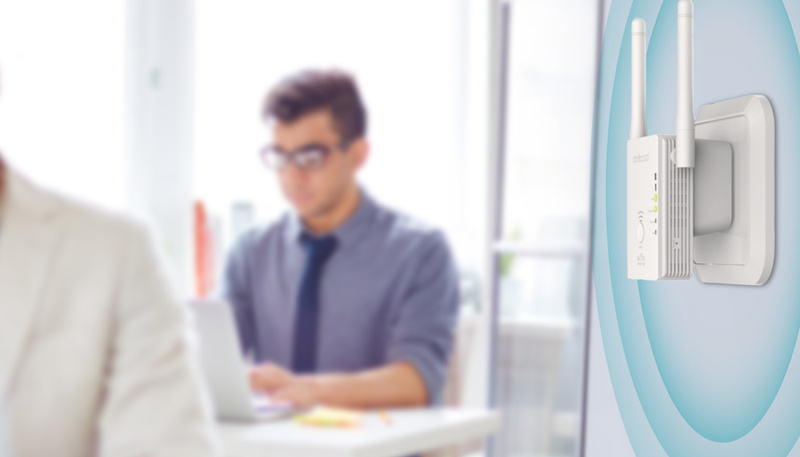 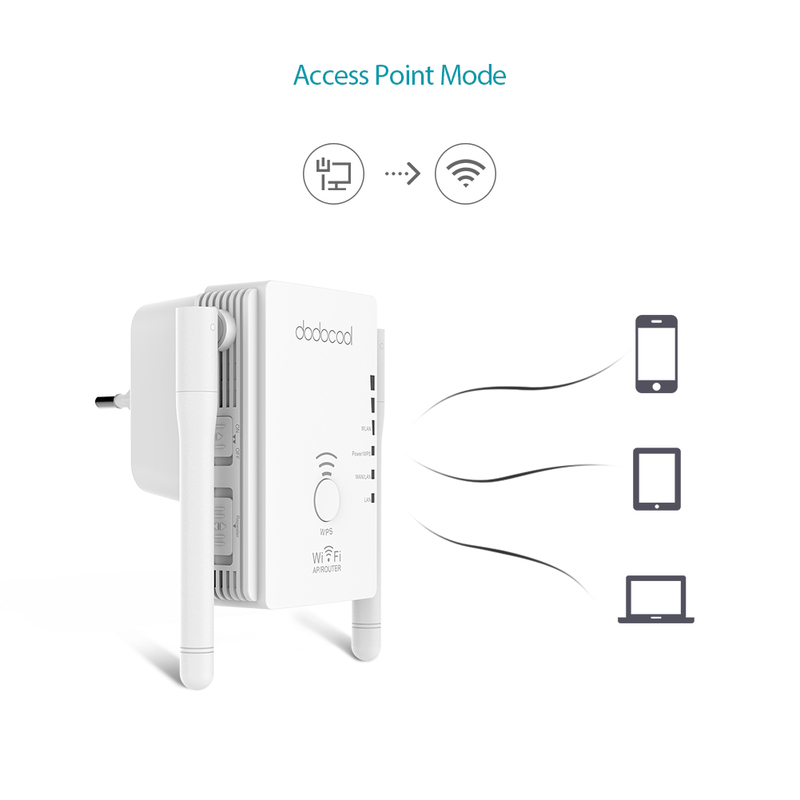 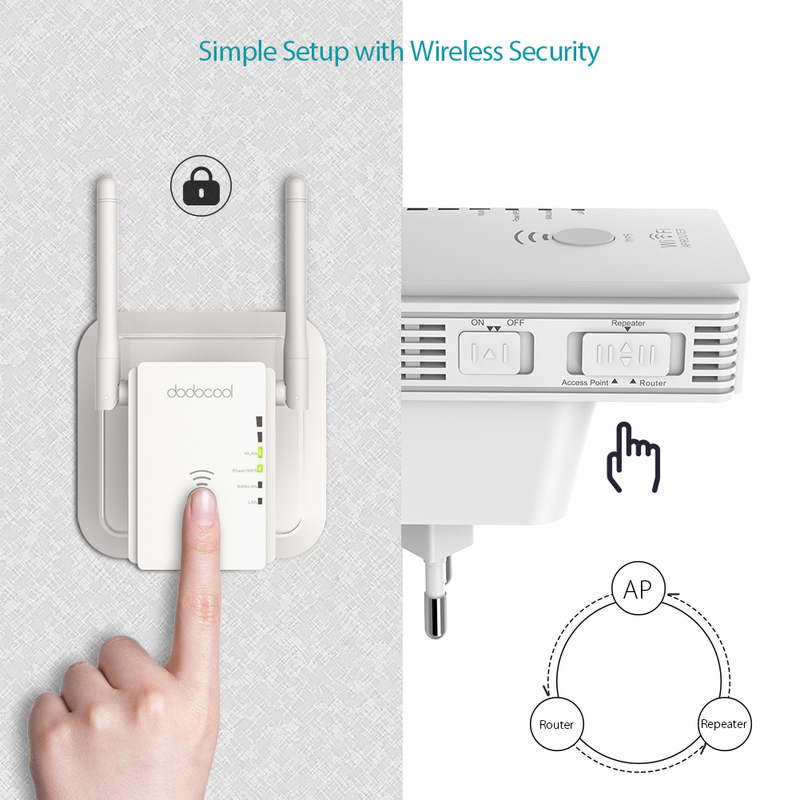 In Access Point (AP) Mode, it can connect to a wired network and turn the single wired connection into a secure, reliable Wi-Fi hotspot for all your Wi-Fi enabled devices. 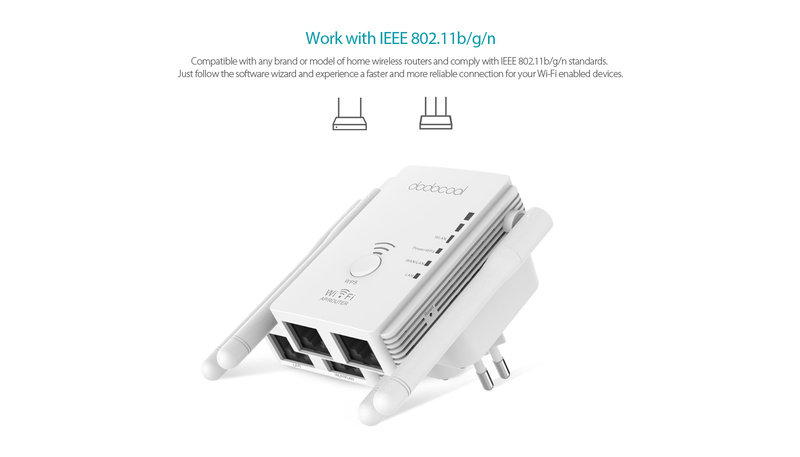 Compatible with any brand or model of home wireless routers and comply with IEEE 802.11b/g/n standards. 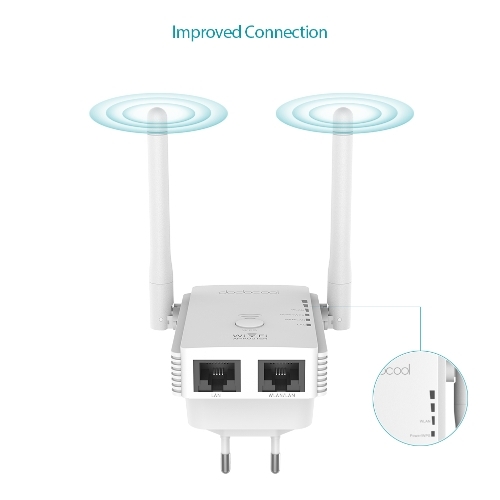 Just follow the software wizard and experience a faster and more reliable connection for your Wi-Fi enabled devices. 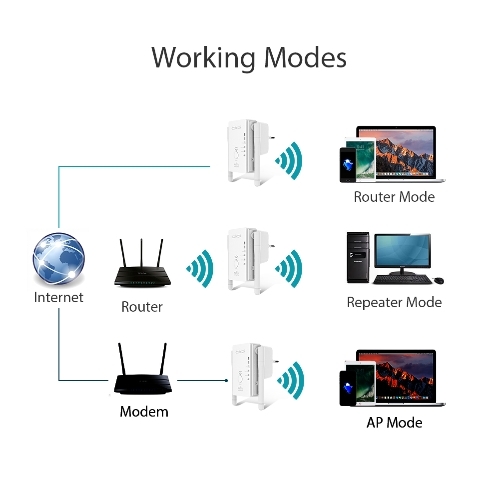 Plug it directly into an electrical outlet and choose among the wireless router mode, signal repeater/range extender mode or access point (AP) mode using the mode switch. 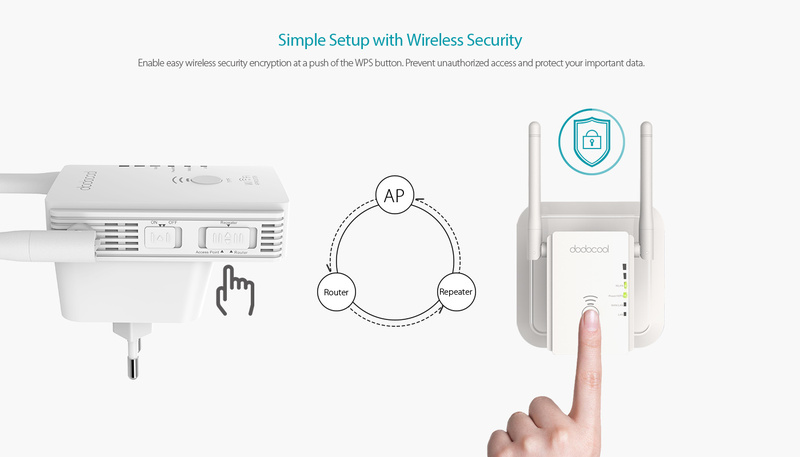 Enable easy wireless security encryption at a push of the WPS button. 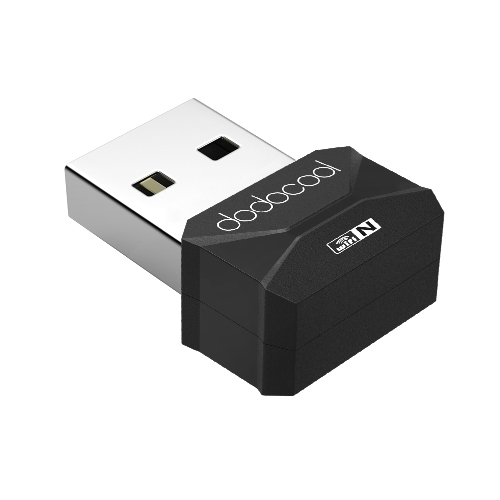 Prevent unauthorized access and protect your important data. Dual external antennas provide better Wi-Fi coverage range and higher speed, keeping wireless connections hassle-free and stable without interruption. 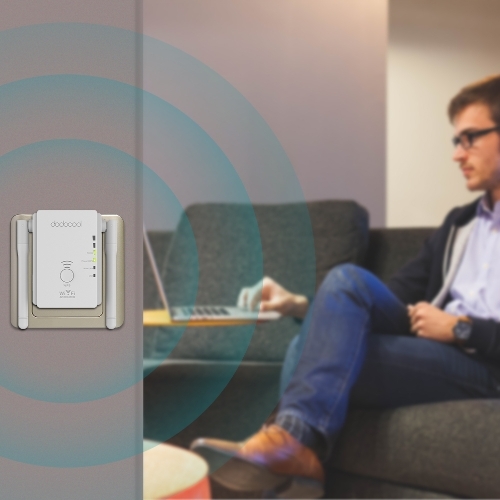 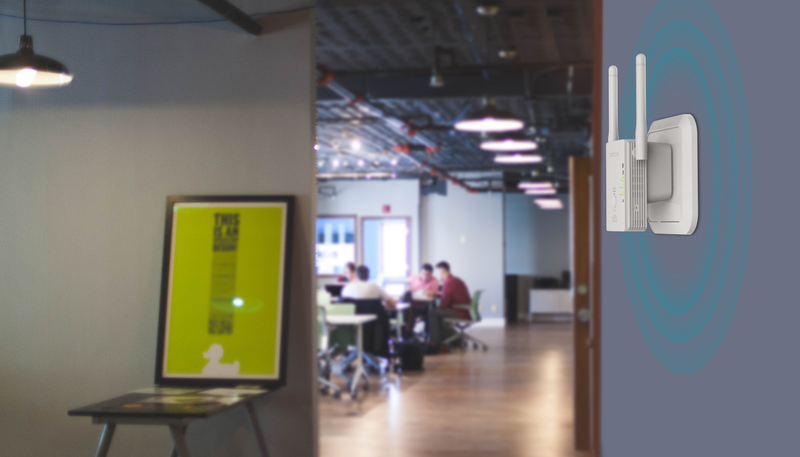 3 Wi-Fi signal strength LED indicators help you find the perfect setup spot. Wireless security: Support wireless security with WPA2, WPA and WEP(128/64 bit).